Under the expenses in “My Cash Flow Framework”, there are two keys points to note. One is to identify what are the necessities and the other is to try to reduce liabilities. For the post, I shall discuss more on the first point. 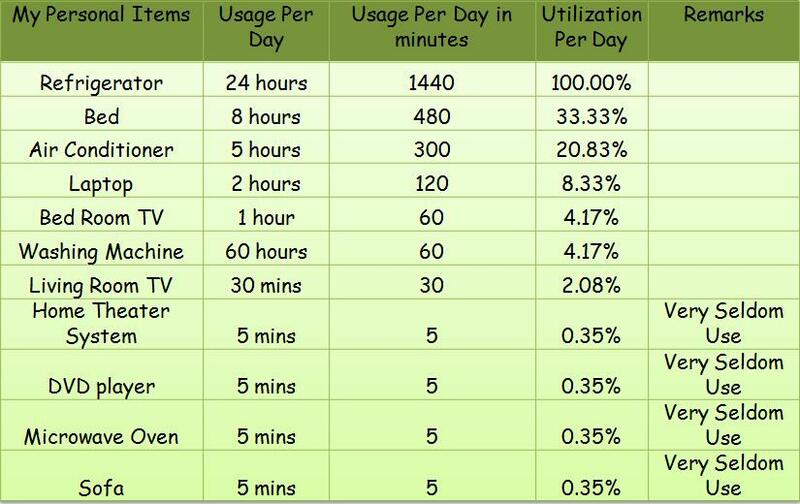 I like to use utilization rate to find out what are my necessities. The formula is very simple, just take the total usage time in minutes and divided by 1440 (total number of minutes per day). I have tabulated the result as shown above for each of my personal items. For items that I seldom, I will estimate it to be 5 minutes per day. 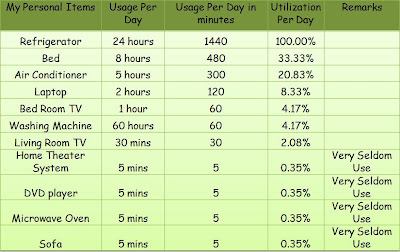 You can see that the top six items that I often use are refrigerator, bed, air conditioner, washing machine, laptop, bedroom TV . I will spend more money on items with high utilization to ensure the quality of these items. I’m also look for longer warranty period to ensure that they are properly taken care of in case of any break down. For items with low utilization, I will be spending less money on them. I might not even want to replace them if they happen to break down. This is one way that I use to identify my necessities. If you have other ways, maybe you can share with me. A small calculation error: number of minutes/day is 1440. For me, I don't have air-con, TV, Home Theater System, DVD player (not counting the one in my computer), Microwave Oven. I didn't have sofa and washing machine for the first 2-3 years :) Though my wife regretted not buying the washing machine sooner. However, my reasonings is less of financial terms, but more in terms of value. I think TV is a waste of time. HTS, DVD etc can be fulfilled by a good computer with relatively big monitor (just changed to a 22") or projector (but the tech/price still not suitable). We are skeptical of microwave cooked/heated food, so instead we have a small thermal oven (also seldom use). Those I have such as refrigerator (~0.8K), mattress (~2K, but bed frame is cheap) and washer/dryer machine (~1K, though dryer is very seldom used), I am willing to spend to get good quality. For my laptop, it is quite seldom use but a necessity when going overseas trips. ps: the spam comments is fast! Thank for highlighting the errors, I have amended it.